Ever wonder..why we don’t build them like we used to? Such beauty in the architecture from long ago…. It is therefore fortunate that the open truss structure supporting the deck is by its nature less subject to aerodynamic problems. 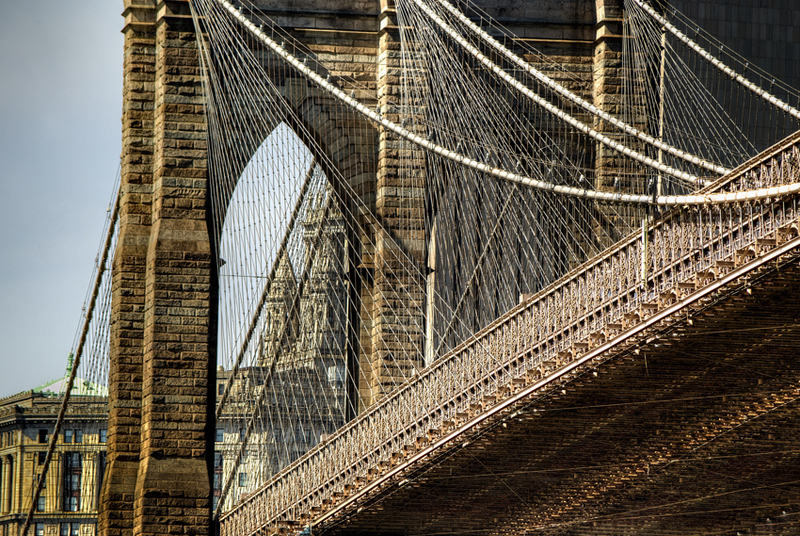 Roebling designed a bridge and truss system that was six times as strong as he thought it needed to be. Because of this, the Brooklyn Bridge is still standing when many of the bridges built around the same time have vanished into history and been replaced. This was shot inside St. John’s Cathedral in NYC. There are no rstrictions on Tripods here, other than to respect the Patrons who are praying. What is interesting about this shot is the camera White Balance (pls email us if you would like a short description on this White Balance thing). I had set it for Incandescent for the lights above the pews, and the result for the natural sunlight from the Rosarie is blue. This is a three shot High Dynamic Range (HDR) image. The building as it appears today conforms primarily to a second design campaign from the prolific Gothic Revival architect Ralph Adams Cram of the Boston firm Cram, Goodhue, and Ferguson. Without slavishly copying any one historical model, and without compromising its authentic stone-on-stone construction by using modern steel girders, Saint John the Divine is a refined exercise in the 13th century High Gothic style of northern France. The Cathedral is almost exactly two football fields in length (601 feet or 186 meters) and the nave ceiling reaches 124 feet (37.7 meters) high. 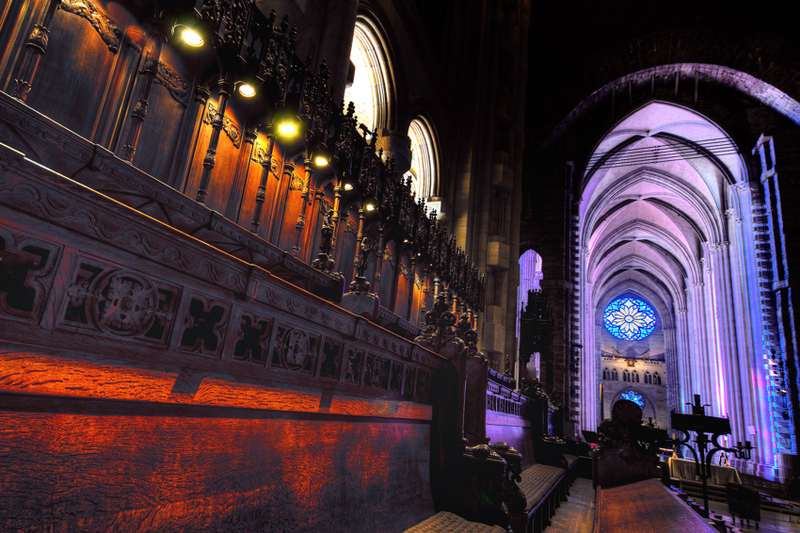 It is the longest Gothic nave in the world, at 230 feet. Seven chapels radiating from the ambulatory behind the choir are each in a distinctive nationalistic style, some of them borrowing from outside the gothic vocabulary. Known as the “Chapels of the Tongues” (Ansgar, Boniface, Columba, Savior, Martin, Ambrose and James), their designs are meant to represent each of the seven most prominent ethnic groups to first immigrate to New York City upon the opening of Ellis Island in 1892 (the same year the Cathedral began construction).